The U.S. Navy commissioned its newest Freedom-variant Littoral Combat Ship (LCS), the USS Wichita (LCS-13), during a 10 a.m. ceremony Saturday, January 12, at Naval Station Mayport, Florida, near Jacksonville, where the ship will be homeported. U.S. Senator Jerry Moran of Kansas delivered the commissioning ceremony’s principal address. Kate Lehrer, author and wife of Wichita native Jim Lehrer, the former anchor of «The MacNeil-Lehrer News Hour» on PBS, is the ship’s sponsor. The ceremony was highlighted by a time-honored Navy tradition when Mrs. Lehrer gave the first order to «man our ship and bring her to life»! «This commissioning represents USS Wichita’s entry into the active fleet and is a testament to the increased capabilities made possible by a true partnership between the Department of the Navy and our industrial base», said Secretary of the Navy Richard V. Spencer. «This ship honors the citizens of Wichita, Kansas for their longstanding support of the Navy and Marine Corps team and I am confident USS Wichita and crew will make our Navy and nation stronger». The USS Wichita (LCS-13) is the third naval vessel to honor Kansas’s largest city. The first was a heavy cruiser in service from 1939 to 1947. Active during World War II, Wichita supported amphibious landings during Operation Torch in November 1942 in the European Theater. She later participated in the Battles of the Philippine Sea and Leyte Gulf and the invasion of Okinawa in 1944 in the Pacific Theater. Wichita earned 13 battle stars for wartime service. The second USS Wichita (AOR-1) was a first-in-class replenishment oiler in service from 1969 to 1993. During her first three deployments, the ship made numerous trips to replenish ships on «Yankee Station», earning four battle stars for service during the Vietnam War. The USS Wichita (LCS-13) is a fast, agile, focused-mission platform designed for operation in near-shore environments as well as the open-ocean. It is designed to defeat asymmetric «anti-access» threats such as mines, quiet diesel submarines and fast surface craft. The LCS class consists of two variants, the Freedom variant and the Independence variant, designed and built by two industry teams. The Freedom variant team is led by Lockheed Martin, Marinette, Wisconsin, (for the odd-numbered hulls). The Independence variant team is led by Austal USA, Mobile, Alabama, (for LCS-6 and the subsequent even-numbered hulls). 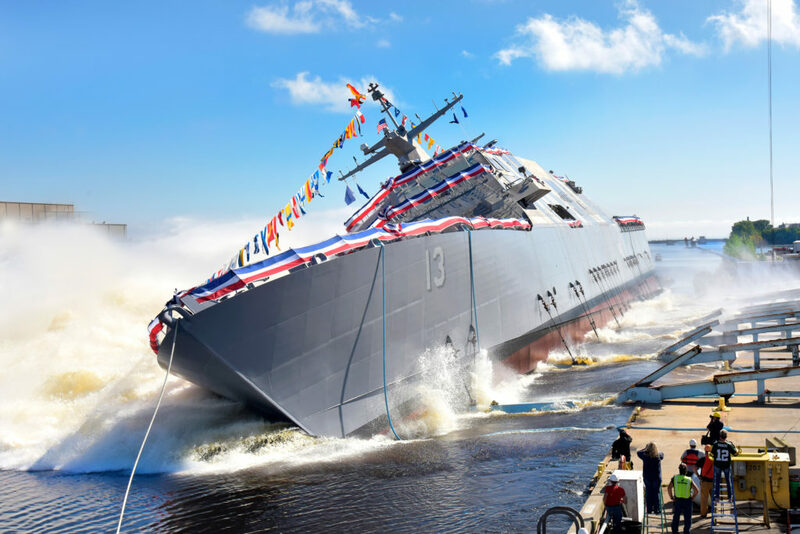 The Lockheed Martin-led industry team launched the 13th Littoral Combat Ship (LCS) into the Menominee River at the Fincantieri Marinette Marine shipyard on September 17. 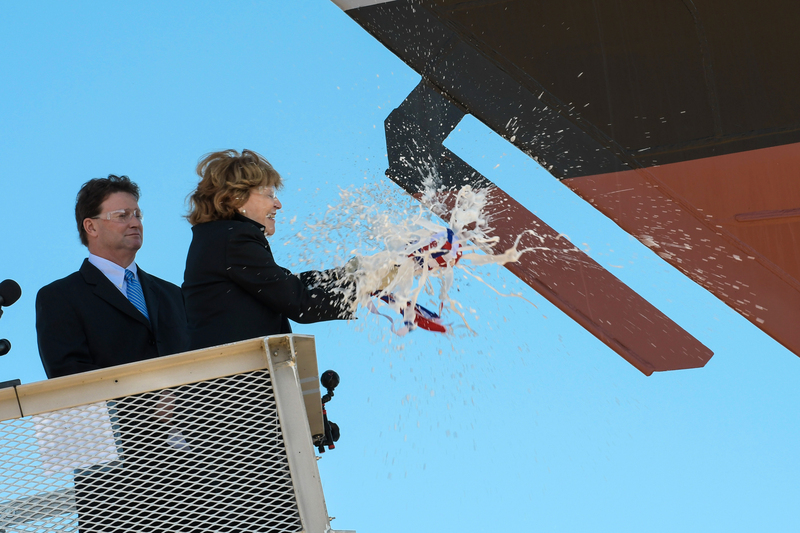 Ship sponsor, Kate Lehrer, christened LCS-13, the future USS Wichita, in U.S. Navy tradition by breaking a champagne bottle across the ship’s bow just prior to the launch. «It is an honor and privilege to serve as the sponsor of the future USS Wichita and to be a part of this major milestone in the ship’s journey towards joining the great U.S. Navy fleet», Lehrer said. «I look forward and to an ongoing relationship with Wichita’s future crews and their families throughout the ship’s service». 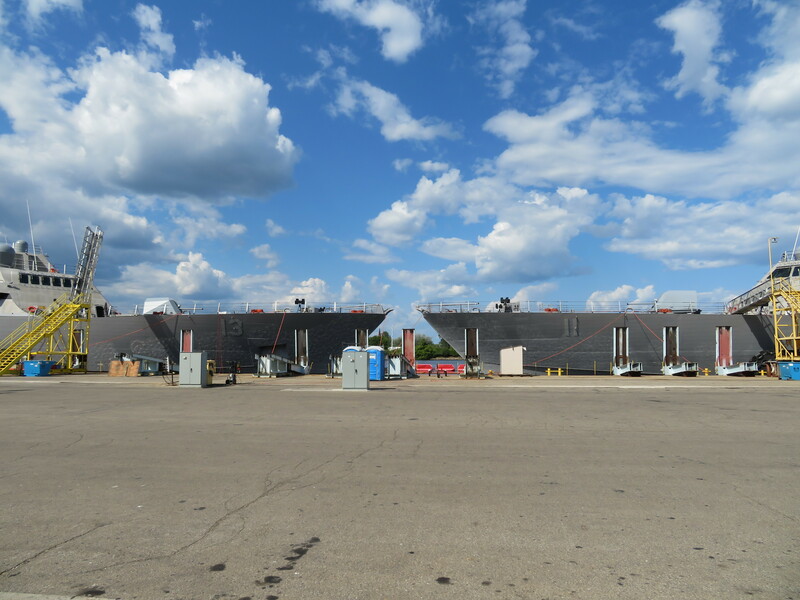 USS Wichita (LCS-13) will undergo additional outfitting and testing at Fincantieri Marinette Marine before the ship’s anticipated delivery next year. «The christening and launch of LCS-13 marks an important step in her journey towards joining the fleet», said Joe North, vice president of Littoral Ships and Systems. «The Freedom-variant LCS plays a critical role in the U.S. Navy’s maritime security strategy, and we are committed to getting LCS-13 and her highly capable sister ships into combatant commanders’ hands as quickly as possible». 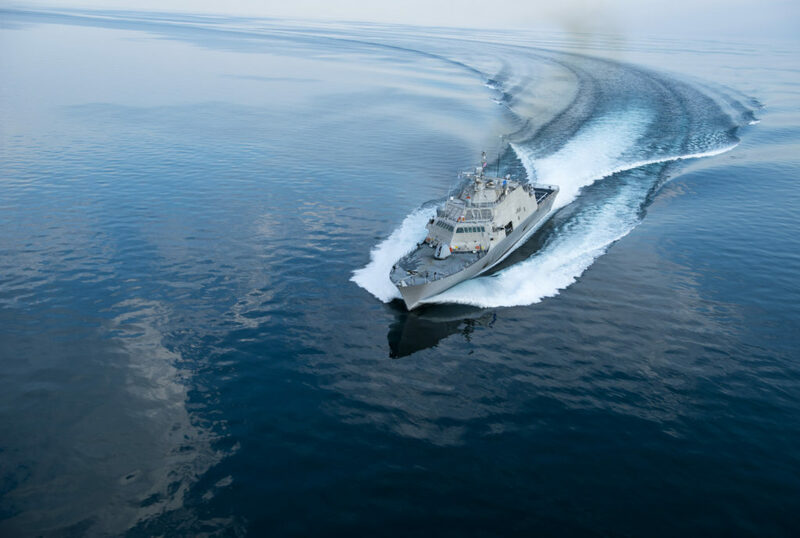 The Lockheed Martin-led industry team is currently in full-rate production of the Freedom-variant, with six ships under construction at Fincantieri Marinette Marine and three more in long-lead material procurement. The ship’s design and open architecture allows the U.S. Navy to rapidly acquire and deploy a fleet of highly flexible and capable ships at a fraction of the cost of other platforms. «Fincantieri Marinette Marine is proud to christen and launch another Freedom-variant warship that will enable our Navy to carry out its missions where and when needed», said Jan Allman, Fincantieri Marinette Marine president and CEO. «We continue to optimize our production processes and leverage the craftsmanship and skills of our employees to produce these high quality vessels for our sailors». USS Wichita (LCS-13) will be the third U.S. Navy ship named USS Wichita. Previous ships to bear the name included a World War II heavy cruiser (CA-45) and a Wichita-class Replenishment Oiler (AOR-1). The Lockheed Martin industry team officially laid the keel for the U.S. Navy’s thirteenth Littoral Combat Ship (LCS), the future USS Wichita, in a ceremony held at Marinette Marine Corporation in Marinette, Wisconsin, on February 9, 2015. Ship sponsor Mrs. Kate Staples Lehrer completed the time-honored tradition and authenticated the keel of Wichita (LCS-13). 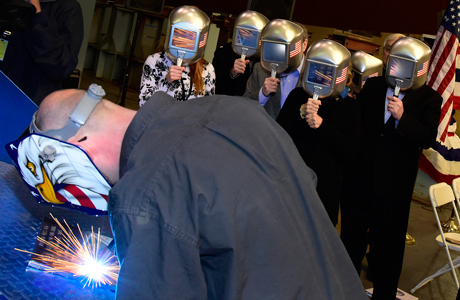 Mrs. Lehrer had her initials welded into a sheet of the ship’s steel, which will ultimately be mounted in the ship throughout its entire service. «This is an honor and a pleasure for me to be a sponsor of the USS Wichita», said Mrs. Lehrer. «My right hand will remain forever in a salute to those men and women who are building and to those who will serve on this special ship». Wichita is a flexible Freedom-variant LCS that will be designed and outfitted with mission systems to conduct a variety of missions including anti-surface warfare, mine countermeasures and submarine warfare. The industry team building Wichita has delivered two ships with six others in various stages of construction and testing. The nation’s first LCS, USS Freedom, completed a U.S. Navy deployment in 2013, and USS Fort Worth (LCS-3) is currently deployed for 16 months to Southeast Asia. These two deployments demonstrate how the ship class is addressing the U.S. Navy’s need for an affordable, highly-networked and modular ship unlike any other in the world. «This ship class, and the industry team behind it, has shown it can adapt to meet the Navy’s most challenging missions and provide a powerful, modular platform», said Joe North, vice president of Littoral Ships and Systems at Lockheed Martin. «We have leveraged best practices and incorporated improvements based on sailors’ feedback to ensure the fleet is prepared and empowered to fight, operate and support the ship in the littorals and open seas worldwide». 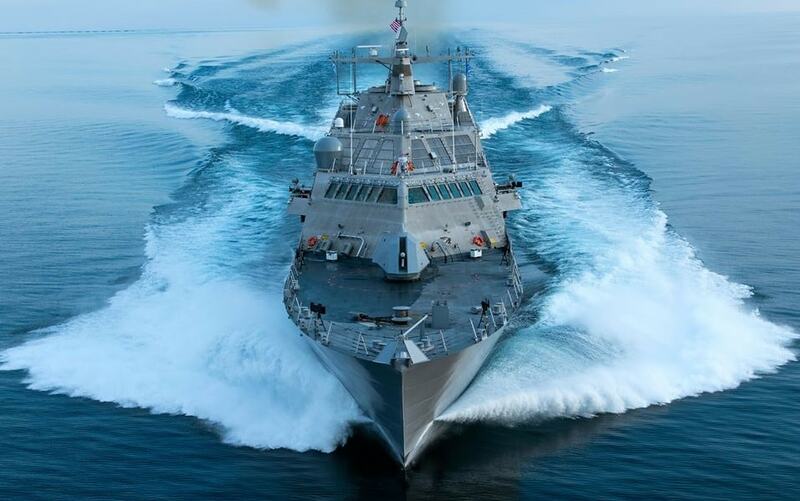 The Lockheed Martin-led LCS team includes ship builder Marinette Marine Corporation, a Fincantieri company, naval architect Gibbs & Cox, as well as nearly 900 suppliers in 43 states. «The LCS 13, Wichita, is a tangible measure of the collaboration and strength within this industry team», said Jan Allman, president and chief executive officer of Marinette Marine Corporation. «I’m extremely proud of our skilled workforce, the hardworking men and women that transform the LCS from a design into a powerful warship that will serve an invaluable role in the Fleet. Through Fincantieri’s expansion and improvement in our facility, Marinette Marine was tailored to grow with this program, and we look forward to continuing our valuable partnership with the U.S. Navy».